One of the most useful things I’ve learned about story is that they are about change. Change through action in the face of conflict. But I don’t expect you to take my word for it. I want to unpack why change is required to tell a compelling story. It becomes easier to see if we think about how a story is different from basic description. Take this excerpt from Death Comes for the Archbishop by Willa Cather. As far as he could see, on every side, the landscape was heaped up in monotonous red sand-hills, not much larger than haycocks, and very much the shape of haycocks. One could not have believed that in the number of square miles a man is able to sweep with the eye there could be so many uniform red hills. A sketch can involve people, places, things, and events, just like a story can, but it lacks movement or change, no matter how vivid it is. It is written observation. An anecdote goes further because something happens, but even if more than one event is included, it lacks meaning. Here’s a good example from E.M. Forster. These are two events, and even though we know one follows the other, we need more to understand the significance of what is being said. It’s not about length because a story can be told in as few as six words. A famous example is usually attributed to Hemingway. We have to read between the lines, but we can tell what has happened and what it means. If we boil an entire story down to its premise (a character in a setting with a problem), we should still be able to get a sense of the change that will occur and what it means. There are practical reasons why stories require change, and the heart of it is narrative drive. Narrative drive is what keeps the reader turning pages out of curiosity or concern. We want to find out what happens, or in other words, what’s going to change? A story where nothing changes is not very interesting, and chances are we’ll stop reading because there is no reason to continue. And while we want to be surprised by what happens, there are specific results we’re looking for. The nature of the change that occurs within a story and that affects the protagonist or their world isn’t random. It should be something we can relate to because it affects human needs. In other words, stories explore the difficulties we encounter as we try to meet our basic needs, and each of the twelve content genres (e.g., action, crime, maturation) we talk about in the context of the Story Grid fits within one of the human needs categories identified by Maslow. In a typical story, change begins with an unexpected event that upsets the status quo for the protagonist or their world. Each content genre has a particular inciting event that kicks the story off. That inciting incident presents a threat or opportunity related to the human need at stake in the genre. Here’s a list of inciting incidents with the human need it impacts. In an Action Story, the villain attacks, which threatens a character’s survival needs. In a Crime Story, a crime is committed or discovered, which threatens a character’s need for safety and security. In a Horror Story, a monster attacks, which threatens a character’s need to survive, but also their safety and security (monsters roaming the neighborhood tend to make us feel unsafe). In a Thriller, an inciting crime, indicative of a master villain, threatens a character’s need to survive, but again, also their security. In a War Story, an inciting attack threatens the characters’ safety and security. In a Western, an inciting attack by a villain or the environment, threatens a character’s safety and security. In a Love Story, the lovers meet, which presents an opportunity to find human love and connection. In a Performance Story, an inciting performance opportunity arises, which affects the protagonist’s need for self-esteem and respect. In a Society Story, a speech by a visionary or a crime serves as an inciting threat to the reigning power, which affects the protagonist’s and tyrant’s need for respect. In a Status Story, an inciting opportunity or challenge arises that affects the character’s fortune and need for self-esteem and respect. In a Worldview Story, an inciting opportunity or challenge to the character’s understanding of the world creates an opportunity for self-fulfillment. In a Morality Story, there is a shock that awakens the protagonist and recalls to them their moral compass. The human needs impacted by the inciting incident also point us in the direction of the Life Value at Stake in the genre. What Is a Life Value? Life values describe states or conditions of human life experience. Because stories are about change, we’re interested in life value shifts, in other words when an event or experience changes a state or condition of life for the characters. Here's a simple example of a life value shift: Before it rains (event), the grass outside is dry (state). After it rains, the grass is wet. That's a change in the state of the environment that flows from a natural event. The same event could affect the life value for a character and might represent a shift from potential death to life or despair to hope if, for example, the property in question is a farm in a region suffering a prolonged drought. Here's an example of a change directly related to a character's state: Before eating (event), a person is hungry (state), and after eating, she is full. That's a change in her physiological state. If she had been deprived of food for two weeks, this event could cause her life value to shift from potential death to life. Here's an example of a value shift in the context of a story scene. Before a man meets a potential love interest (event and experience), he might feel alone (state), and after the two connect, they are together (at least temporarily), and he might feel companionship. The same scene might be characterized as a change from being unaware (if the two don't know of each other) to attraction (if they like each other). Either way, the event causes a change in the mental or emotional state of the character. Over the course of an entire courtship love story (like Pride and Prejudice), two characters might move from being unaware all the way to commitment. Each scene in a story can have a variety of life value changes. Some changes will be directly or indirectly relevant to the global genre’s life value at stake, and some will not. The life values you want to pay attention to are those that affect the life value at stake for your primary genre. Here are the life values at stake in each of the major content genres. In an Action Story, the global life value changes on the spectrum of life and death. In a Crime Story, the life value changes on the spectrum of justice and injustice. In a Horror Story, the life value changes on the spectrum of life and death, but there is risk of moving to the extreme negative: a fate worse than death. In a War Story, the life value changes on the spectrum of victory to defeat combined with honor to dishonor. In a Western, the life value changes on the spectrum of autonomy or freedom to subjugation. In a Love Story, the life value changes on the spectrum of love and hate. In a Performance Story, the life value changes on the spectrum of respect and shame. In a Society Story, the life value changes on the spectrum of power and impotence. In a Status Story, the life value changes on the spectrum of success and failure. In a Worldview-Maturation Story, the life value changes on the spectrum of sophistication and naïveté. In a Worldview-Education Story, the life value changes on the spectrum of meaning and meaninglessness. In a Worldview-Revelation Story, the life value changes on the spectrum of wisdom, knowledge, and ignorance. In a Morality Story, the life value changes on the spectrum of selfishness and altruism. Just as each genre opens with an inciting incident that changes a specific life value, there is a Core Event that presents the opportunity for lasting change toward the end of the story. In an Action Story, the core event is the hero at the mercy of the villain scene. In a Crime Story, the core event is the exposing the criminal scene. In a Horror Story, the core event is the victim at the mercy of the monster scene. In a Thriller, the core event is the hero at the mercy of the villain scene. In a War Story, the core event is the big battle scene. In a Western, the core event is the hero at the mercy of the villain scene. In a Love Story, the core event is the proof of love scene. In a Performance Story, the core event is the big performance scene. In a Society Story, the core event is the revolution scene. In a Status Story, the core event is a moment of choice when the protagonist must change their definition of success or risk their inner moral code. In a Worldview Story, the core event is a moment of choice when the protagonist chooses to abandon their misconception about the world or not. In a Morality Story, the core event is a moment when the protagonist must choose some level of altruism over selfishness. Let’s look at how a life value change within a scene can affect the story’s life value with a simple example from a crime story. The inciting incident includes discovery of a murder victim’s body, and that scene moves the life value for that unfortunate character from life to death. The human need implicated in a crime story is safety and security, though, and the life value at stake is justice and injustice. The two are related but different; an unlawful killing is unjust for the victim and affects society’s need for security. In a crime story like this, a detective (amateur or professional) investigates the crime and potential suspects. If they are successful in unmasking the criminal, the story value changes from injusticeat the inciting incident to justicein the Core Event when the criminal is exposed and brought to justice. This change happens over the course of the entire story, as the result of changes within scenes. Each scene should bring the protagonist closer to or further from the positive value of the global genre. In a crime story, the detective discovers clues and red herrings that make it more or less likely they will solve the crime and restore justice. In other words, the story-level change is driven by the smaller changes that happen within scenes. What is the primary change that happens from the beginning to the end of the story? Can you identify the primary human need the protagonist is trying to meet? Or the human need the force of antagonism is preventing the protagonist from attaining? What is the event that gets things moving in the story? Can you see how it impacts a particular human need of the protagonist? How would you describe the change that happens in that moment? Can you identify the Core Event in the story? Do you see how the life value changes for the protagonist in that moment? What kind of stories are you drawn to? Is there a pattern to the life values at stake in those stories? Stories are change through action in the face of conflict. Next week, I’ll look at story-level conflict. If you have any questions or topics you would like me to cover in future posts, leave a comment or write to me at hello@writership.com. If you enjoyed this post and want more from Writership, join our crew. 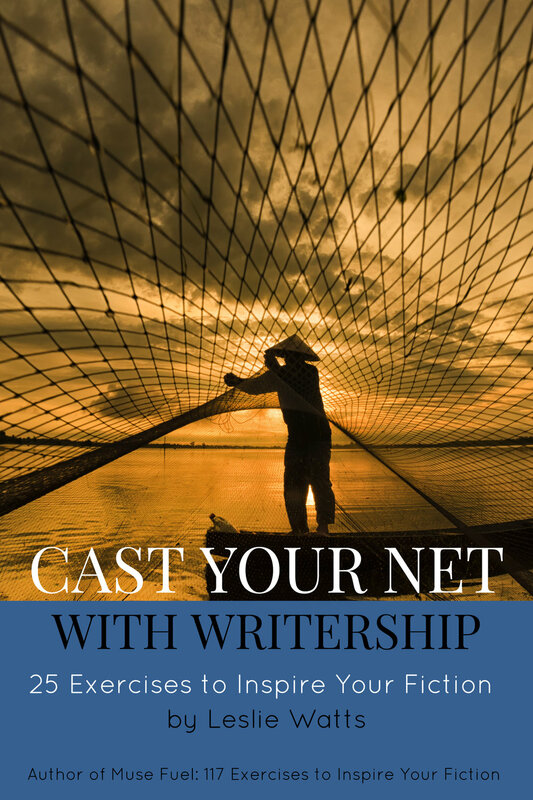 You'll receive our newsletter and a free copy of Cast Your Net with Writership, a collection of 25 exercises to inspire your fiction.